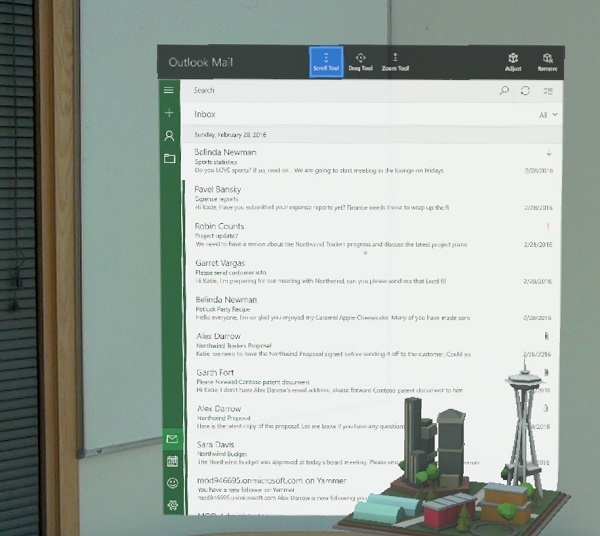 Microsoft brings Outlook Mail and Calendar apps to HoloLens. Microsoft today brings the first holographic email and calendaring apps, Outlook Mail and Calendar, to HoloLens-the first fully self-contained holographic computer. 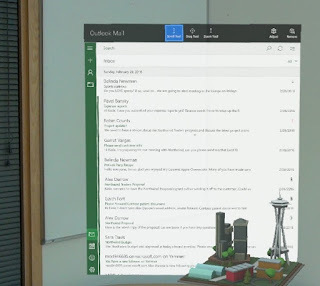 With Outlook Mail on HoloLens, you can now place your inbox on your office wall to stay on top of emails while simultaneously interacting with other digital content in your real world. You can also quickly see what's coming up next in your day with your new wall calendar. Since Outlook Mail and Calendar apps are built on the Universal Windows Platform (UWP), like other Office apps for HoloLens released at //build 2016, it was easy for developers to deliver a familiar experience to users who are already using the apps on Windows 10 PCs, tablets and phones. How do I get Outlook Mail and Calendar apps on HoloLens? Open the Windows Store on HoloLens, and search for Outlook Mail and Calendar. Click "Free" to follow the steps for installation.